Is there a better alternative to JustLooking? Is JustLooking really the best app in Image Editing category? Will JustLooking work good on macOS 10.13.4? It focuses on files and directories instead of lists of files. Thus, once you load a file, you can easily navigate through all other files in the same directory. It displays images at their native resolution instead of interpreting DPI information stored in the image meta-data. While images are printed at the maximum resolution possible, on screen they are displayed pixel-by-pixel. Contains translations for English, Catalan, Dutch, French, Italian, Spanish, Slovenian, Polish, Brasilian Portuguese, Chinese (Simplified), Korean, German, Finnish, Slovakian, Turkish, Croatian, Romanian, Arabic, and Portugal Portuguese. 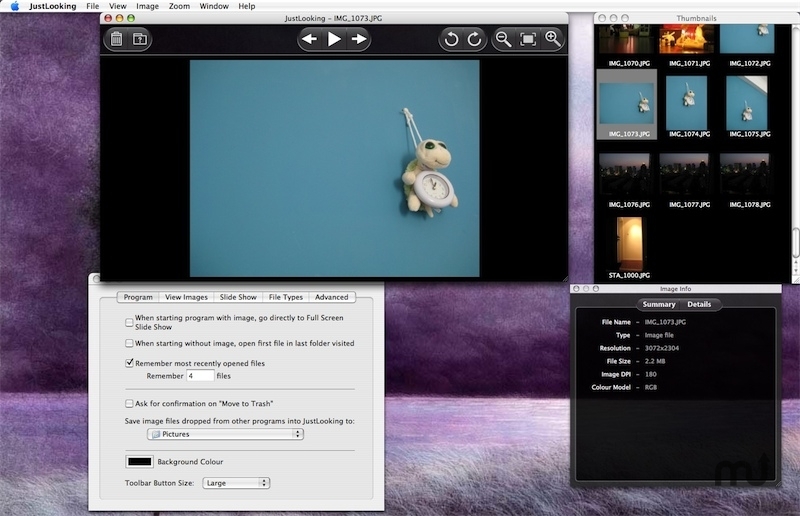 Being designed more for viewing of Images, it properly shows animated GIF files. The entire program can easily be manipulated and powered by simple keystrokes for a quick and pleasant viewing experience. There is support for printing, image resizing, saving to a few key image formats, and displaying of all image info.